Loan defender Danny Collins scored a last-minute equaliser to earn West Ham what could prove to be a vital point at Leeds, as they extended their unbeaten run to eight games. When Luciano Becchio nodded Leeds ahead with seven minutes to go, the ever-changing npower Championship promotion picture was not looking too favourable for the Hammers, with top two rivals Southampton and Reading both winning. But, right on cue, Collins rose the highest to head in a Mark Noble corner and peg Leeds back in an act of damage limitation for Sam Allardyce's men, who are now five points off the lead and three points shy of second. It was just the second goal Leeds have conceded under new manager Neil Warnock and perhaps one of their most costly of the season. Since the veteran replaced Simon Grayson a month ago, a renewed play-off push had seemed a possibility. A win was needed today, though, and until Collins struck, it seemed they had got it. Warnock had succeeded in his wish to see Elland Road sold out for the game, but those inside had little to cheer about in a chanceless opening 10 minutes. Things livened up after that, with Leeds defender Tom Lees' scuffed effort scraping just wide and Robert Snodgrass jinking his way into a shooting position, only to be crowded out. West Ham's players were then angered by Paul Connolly's tackle on Kevin Nolan - deemed legal by referee Peter Walton - but had more to be concerned about moments later when Nicky Maynard missed the game's first genuine chance. The striker nipped in ahead of Darren O'Dea to find himself through on Andy Lonergan's goal with 22 minutes gone, but his first touch was heavy and the goalkeeper was able to get out and smother the ball at his feet. More clever play from Snodgrass then saw him create an angle to set Ross McCormack free but Matt Taylor nicked possession from him, before Snodgrass flashed a free-kick from the corner of the box just wide of the post. Maynard's chance remained the best going into the break, though, but both sides had cause for complaint when the whistle was blown, with West Ham claiming a handball in the box against Michael Brown and Leeds confused as to why Snodgrass' touch beyond Robert Green was ruled out for apparent pushing by Becchio. The Hammers had to replace James Tomkins, so effective in the sweeper position, at half-time, and his replacement, Gary O'Neil, skimmed an effort just wide within 60 seconds of his introduction. With Maynard isolated and getting little change out of Lees and O'Dea, Allardyce opted to replace him with the more physical Carlton Cole and the former England striker nearly made an immediate impact, putting a ball across the six yard box that evaded everyone. A couple of thundering tackles from loan defender Paul Robinson then helped whip up the home crowd, but it was West Ham who continued to probe with greater intent - Abdoulaye Faye nodding wide from a corner and Lonergan denying O'Neil after Jack Collison's shot flew loose. Cole then arched a header over the bar from a Noble free-kick, before Green was forced to make his first save in the 70th minute when he showed terrific reactions to turn away a Connolly header. Connolly rarely ventures into opposition territory but, when he did again with 83 minutes on the clock, it created the opening goal. 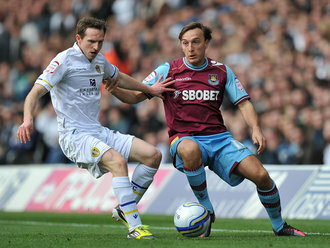 Snodgrass' cross got to the back post, Connolly headed against the bar and the ball fell to Becchio who did the rest. The lead would only last seven minutes for the home side, though, as West Ham secured a deserved point when Collins connected with Noble's well-taken corner. Leeds Lonergan, Connolly, Lees, O'Dea, Robinson, Snodgrass, Brown, Clayton, White (Webber 76), McCormack (Forssell 76), Becchio. Subs Not Used: Pugh, Nunez, Thompson. West Ham Green, O'Brien, Collins, Faye, McCartney, Noble, Nolan, Collison (Morrison 81), Tomkins (O'Neil 46), Taylor, Maynard (Cole 56). Subs Not Used: Henderson, Baldock.